ANCHOR K - THE BRAND THAT BUCKS! 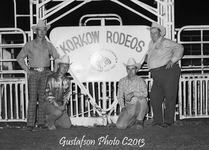 Third generation rodeo producer and stock contractor, Korkow Rodeos LLC, has been producing rodeos for over 60 years. Pierre, South Dakota, has been home to the Korkow family since the 1920s. Over 90% of Korkow bucking stock is raised at their 20,000 acre ranch, the Anchor K, nestled in the rolling hills of the Missouri River. Their stock is branded on the left hip with the Anchor K. Jim Korkow likes to say, "It's the brand that bucks! ".